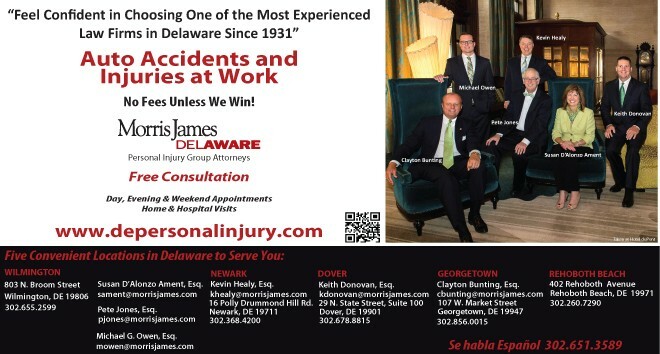 Recently the Morris James Personal Injury team tried a personal injury case in Delaware’s Superior Court and were successful in getting a very good verdict for the client, in large part due to their utilization of cutting edge visual trial graphics. A good trial attorney is a good story teller. Unfolding the story to a jury is much more effective today with the support and use of visual aids. Jurors not only want to hear about the incident, they want to see what is at issue. In this particular case the jury heard evidence of significant spinal cord injuries from three doctors and one dentist. At times, the information was very technical and intricate. To assist the jurors in understanding the medical evidence, the Morris James Personal Injury trial team used visual graphic illustrations and computer animations to assist the jurors by allowing them to visually see and better understand the extent of the injuries suffered by the client victim as a result of a serious motor vehicle accident. We believe, when compared to other jury verdicts for similar injuries in this case, the use of the visual aids and animations increased the overall value of the victim’s injuries in the jurors’ minds. While visual graphics and animations are commonly seen in courtrooms on television and in the movies, the use of these graphics is very costly and not as commonly used in the “real” courtrooms of our community as often as one would think. One of the reasons these visual graphics are not used is because Delaware Judges have routinely denied successful plaintiffs reimbursement of visual graphics and illustrations costs used at trial. However, it is our understanding that this case was the first Delaware case in which a Superior Court judge ordered that the defendant’s insurance company pay fees incurred by the injured victim for costs associated in presenting demonstrative aids. The Judge noted that other federal courts have long recognized, “Computers, computer graphics, digitized documents, and other technological advancements have become important tools of the modern-day trial lawyer.” DiBella v. Hopkins, 407 F. Supp. 2d 537, 540 (S.D.N.Y. 2005). Courts recognize trial graphics and visuals aids help the jury by focusing attention on salient documents and concepts. Courts recognize these demonstrative aids are useful at trial because it is an educational process. This ruling will result in the more frequent future use of these aids and will help the skilled and creative trial attorney tell the story of the injured person. This is significant for all future victims that require a jury to decide the value of their case. The effective presentation of a jury trial is ever changing and evolving. Being the very best story tellers we can be by utilizing cutting edge technology to help our injured clients achieve the result they deserve is what makes our job so challenging and rewarding. ← Previous Story Pre-Nup? I Don’t Need No Stinkin’ Pre-Nup!